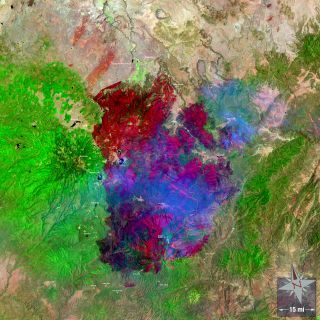 A Landsat 5 image of the Wallow Fire, the largest wildfire in Arizona's history. In this image, acquired on June 15, 2011 the burn scar is red, ongoing fires are very bright red, smoke is blue, water is black and dark blue and bare ground is tan. Image added July 23, 2012. After documenting the changing face of our planet since 1984, the longest-running Earth-observing satellite, Landsat 5, will retire soon, the U.S. Geological Survey has announced. The satellite, which will be retired in the next few months, has long outlived its initial three-year mission. It has circled Earth more than 150,000 times during its nearly 29 years in space, and has snapped more than 2.5 million images of the planet's surface along the way. Throughout its prolific career, Landsat 5 has captured images of the aftermath of the Sept. 11 terrorist attacks, the Chernobyl disaster, the expansion of sprawl around cities like Las Vegas, deforestation in Mexico, and even crowds descending on the U.S. capital to witness President Barack Obama's 2009 inauguration. "Any major event since 1984 that left a mark on this Earth larger than a football field was likely recorded by Landsat 5, whether it was a hurricane, a tsunami, a wildfire, deforestation, or an oil spill," USGS Director Marcia McNutt said in a statement. "We look forward to a long and productive continuation of the Landsat program, but it is unlikely there will ever be another satellite that matches the outstanding longevity of Landsat 5." The first series of maneuvers to safely lower Landsat 5 from its operational orbit is expected to occur next month, according to USGS officials. With one mission ending, another is about to begin. NASA is scheduled to blast Landsat 8 — also called the Landsat Data Continuity Mission (LDCM) — into orbit on the back of an Atlas 5 rocket in February 2013. The new satellite arrived at its launch site at Vandenberg Air Force Base in California last week, NASA officials said. LDCM has two instruments. One is the Operational Land Imager, which will collect data in visible, near infrared and shortwave infrared wavelengths. It will also conduct observations in two new spectral bands — one designed to help coastal waters, the other to detect hard-to-see cirrus clouds, according to NASA officials. The other instrument is the Thermal Infrared Sensor, intended to measure the temperature of the Earth's surface. "Both of these instruments have evolutionary advances that make them the most advanced Landsat instruments to date and are designed to improve performance and reliability to improve observations of the global land surface," Ken Schwer, LDCM project manager at NASA Goddard, said in statement.